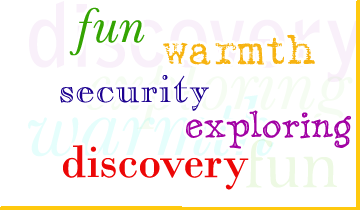 It is our philosophy that childhood should be a time of fun, warmth, security, exploration, and discovery. Provided with an atmosphere and environment for learning and sharing, children, teenagers, and adults will flourish and prosper. They will learn to master and safely express their feelings and address life's challenges.